I photographed the nature images for this series at a pond in Redding, Conn., that once belonged to Edward Steichen. I often find inspiration there. 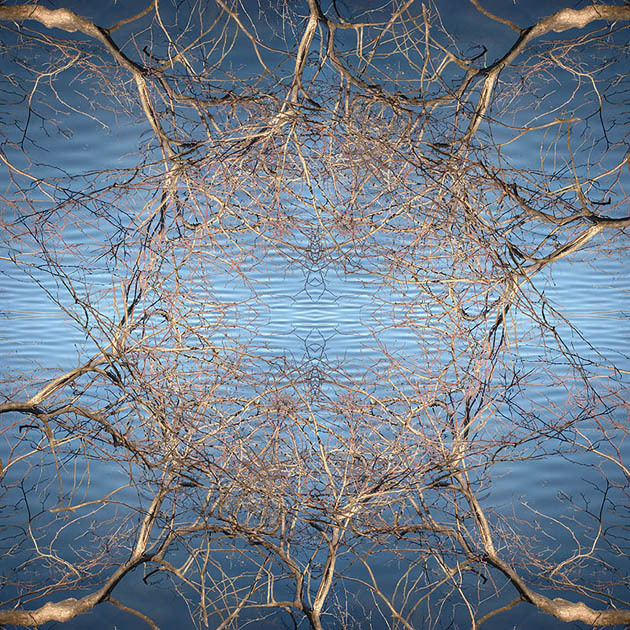 I reworked the images of branches, rocks, and water into kaleidoscopic impressions that speak to that inspiration. The word kaleidoscope is derived from ancient Greek, Kalos or “beautiful, beauty.” Far more than mere decoration, the symmetry of radial, repetitive patterns has always evoked a deep aesthetic, emotional, and even spiritual response from humans across cultures. As a professor of photography, design, and pottery, I teach my students to order two- and three-dimensional space with an appreciation of this ancient understanding. I have always been drawn to a formalist approach to my image making. The visible world serves as a means to explore the language of ordered space. I find working with reflection symmetries to be immensely satisfying. The simple act of centering and finding the center is the unifying principle tying together the varied media that I teach. Pigment print March, 2012 22" X 22""